Horizon’s exclusive TurfGro Plus product line changes the way you look at fertilizer. By adding proprietary amendment products from vendor partners like Aquatrols and Sanctuary, TurfGro Plus improves water efficiencies while building microbial diversity. Like the TG Plus 23-0-4 Complete Soil Care. 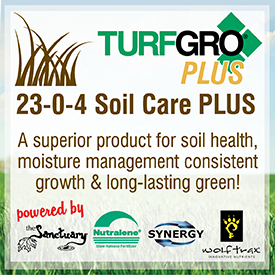 This exclusive formulation includes Sanctuary Organic Protein Meals for improved soil health, Aquatrol’s Synergy wetting agent for moisture management, and WolfTrax Iron for deep green color. Add in Nutralene slow release fertilizer for consistent growth and you have a fertilizer certain to give you healthy, green turf all season long. Available only at Horizon stores. Learn about the complete TurfGro fertilizer line here.